Aiken's contribution is a colorful 10-foot by 5-foot painting, "All in All." For more information go to this Pioneer Press article. Slowly cooling to soft blue and stark white. Time slows, thoughts deepen, creativity warms. Come join us for a night of music and art. 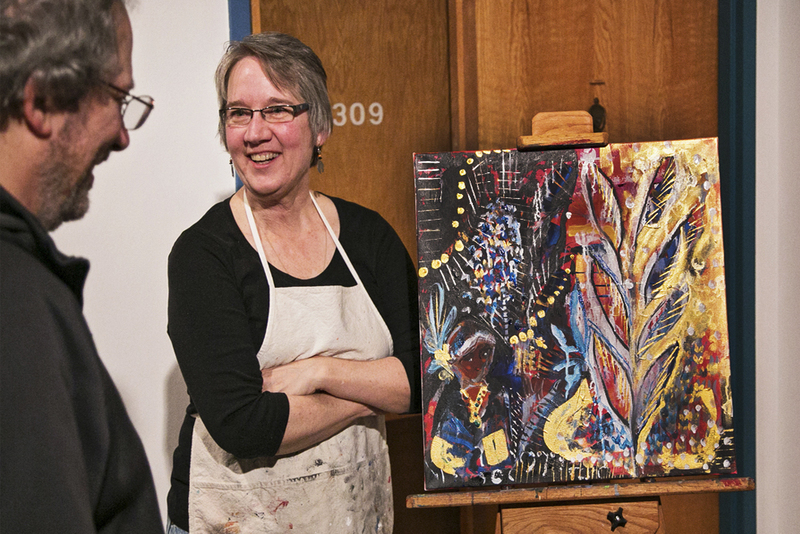 Artists: Lowertown Lofts Co-op Members Shelly Losee and Tara Tieso! Ta-coumba is an internationally recognized artist, arts administrator, public speaker and community activist. Aiken focuses on public art and collaborative projects. Ta-coumba Aiken once again is exploring and expressing his "Visual Voice". He is used for community engagement and social activism. Aiken lends his talents to draw people's attention to the big issues in, inequities in homelessness, health, education, race and gender. He also believes in love for his fellow human being and all living things most importantly our planet.
" Superlative Realism " and smiles. " I created my art to heal the hearts of people and their communities by evoking a positive spirit."